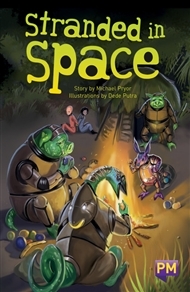 Trina and her family are on a long journey through space to their new home on the planet Bounty, when they have to evacuate their damaged ship. Trina’s escape pod spins off course, and she finds herself stranded on Epsilon Gamma, a planet made up of tropical islands. All by herself, Trina has to make a shelter, find food and keep out of danger … but is she really alone?